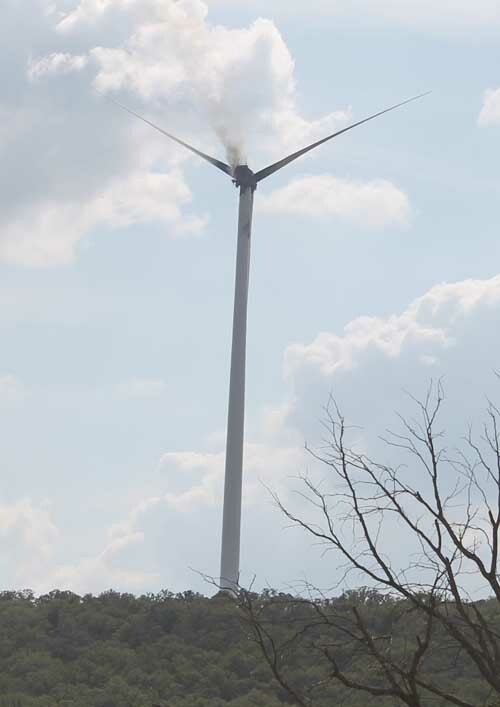 A wind turbine caught fire north of Bryson this afternoon shortly after 1 p.m. The turbine, located south of Loving Road in the Cox Mountain vicinity, part of the Senate Wind Farm, burned as firefighters monitored it. No one from Gamesa, the contractor providing operations, warranty and maintenance service, or Algonquin Power, the majority owner of the wind farm, was available for comment. The turbines that comprise the Senate Wind Farm are Gamesa G9X-2.0 MW wind turbines. The 75 turbine 150 megawatt farm was completed in November 2012. Jacksboro Newspapers will update this story as more information becomes available.